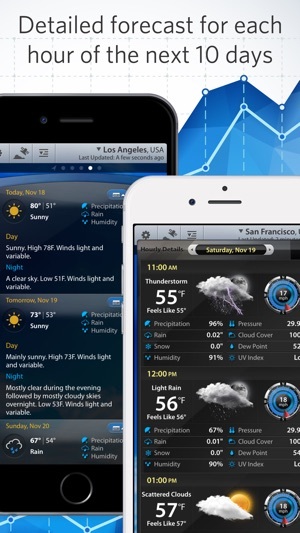 BEST weather app for iphone and watch! 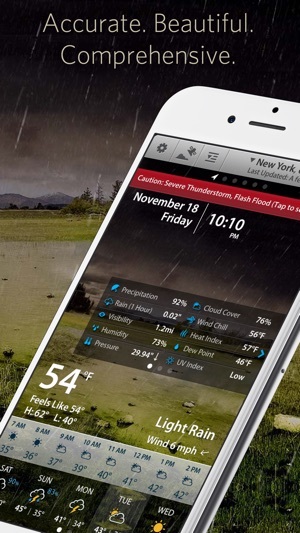 Weather mate pro has everything i wanted and more for following all the weather. and with the new watch complication, you get all the amazing weather details on your watch. plus the same alerts/ warnings/ etc you get on your phone. the amount of customization you can choose is amazing. for example, to start, choose the weather station you prefer from the places you've picked. then customize the different complications on your watch. i give it 5 stars! since, nothing is perfect, here's what i'd like to see changed. change the big part in the top box, it gives me the feeling of an older digital alarm clock. i always wished that the time display and blue bulls eye/wind direction gauge was done differently. and definitely not so big, it's out of sync with the rest of the more modern and somehow friendlier looking graphics. i like the big weather graphic in the top box though (sun behind the clouds, sun, etc...). 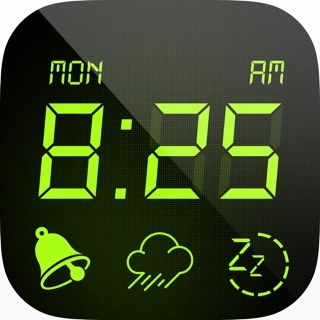 and lastly, i love all the weather details now available on my watch. but in the future, being able to view all the details for more than one location (current or home), on the watch, would be great. so, home/current location plus other picks (los angeles, washington d.c., etc.) available to view on the watch. even so, this weather app still stomps all the others. 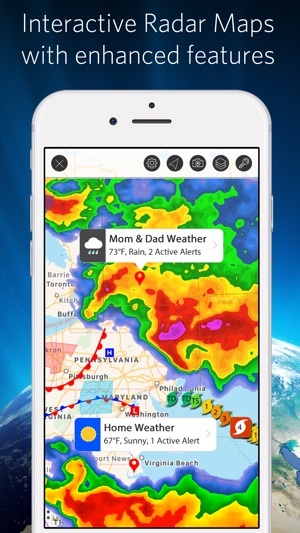 for loads of clear, useful, detailed, timely and customizable weather data (in the usa and beyond), this is the weather app to have. This weather app gives great detailed information concerning weather in my area and state. It is very customizable in selecting how I want to be informed. A good map section I can customize to give up to date weather and even direction of storm systems and information when I tap on the small directional grid and gives air quality reports. 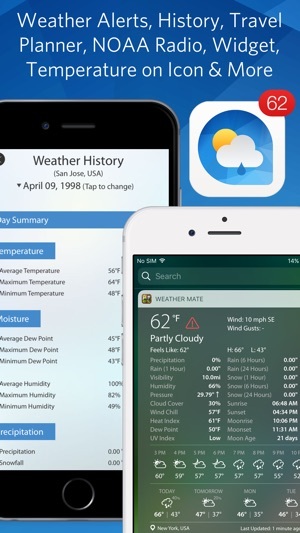 In the Advanced section of Settings, it takes a little time to get to know the features and there is even a section that explains weather contitions. 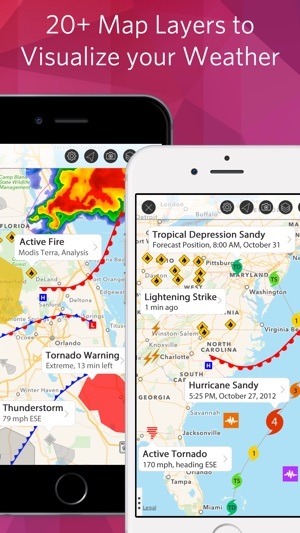 You really have to explore this app to see how it can inform you on weather conditions. Gives a look ahead by hour, day or week and an active wind guage to show the direction and speed, has a red bar for server alerts, a voice option to give conditions. There is even a Travel Planner showing conditions when you are scheduled to take a flight. It will select the closest station to give a more accurate prediction or you can select a station in your area. I reccommend the Pro just to support such apps as this one that really gives the kind of information needed to be well informed. Well designed and layed out to tell you what you need and want to know. There is even an option for earthquakes. If any con I have to give it, the small print because of the detailed layout, but it is still very legable. I must admit I have the iphone se (like it very much). 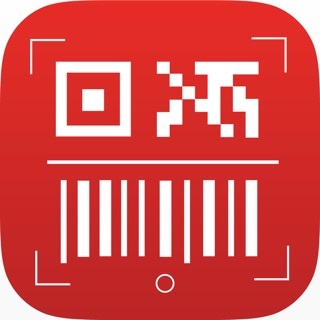 Yet, this is a great app to have on your iphone that gives such detailed information! !